It's no mystery that the Hae Min Lee murder is still a bit of a mystery. Serial, which debuted in Fall of 2014 covered many pieces of info about who was involved, where things took place, and the shady details surrounding a high school murder, in their twelve podcast episodes. It seems like the more details that were reviewed to the viewer the more complicated the case became. Tasked with creating a data visualization for the podcast and some of it's information, my design partner Laura Morgan and I tackled the whereabouts of the three main people the podcast revolved around based on their stories (or the stories told for them) and the corresponding cell phone logs. Between the two of us we listened to the podcast three times and took copious notes. This information gathering lead us to the conclusion everyone else seems to come to. This case is riddled with different takes and is not cut and dry. 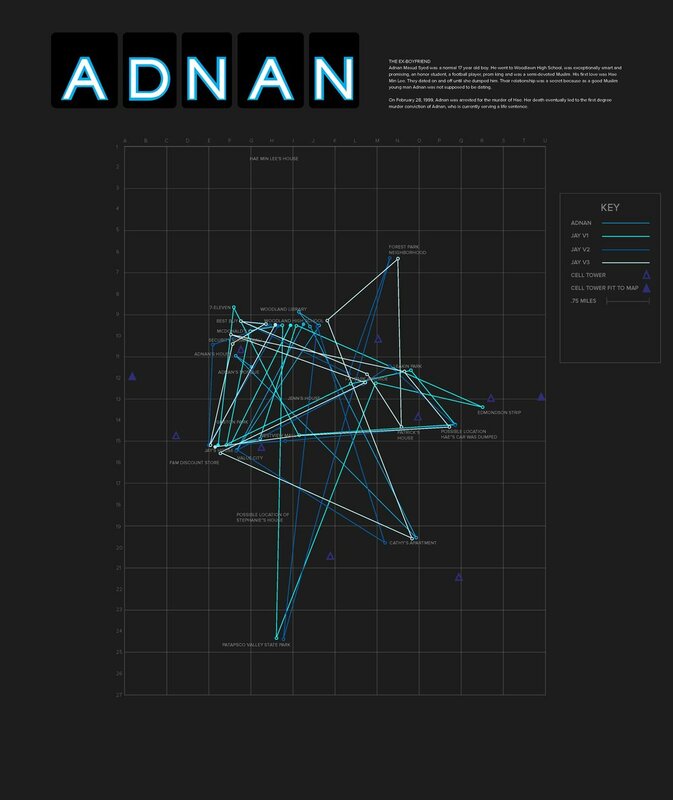 We created a series of posters to show where Hae, Adnan and Jay were on the day of Hae's murder to the best of our knowledge based on our research. We also created a visual of the call log color coded to who was making and receiving the calls throughout the day of the murder. This first poster highlights the routes taken by all three people that day as well as the call log. We know the least about Hae's day on January 13, 1999. She goes to school, later she is murdered. Where she was an the time of the murder and where her body was driven to after are still unknown except that her body was discovered at Leakin Park weeks later. Adnan has his own story to tell and Jay tells three different versions of what Adnan did that day as well. Additionally, Jay had three different versions of the story for himself. Pretty shady. This was a quick sprint project where Laura and I visualized the facts given throughout the podcast. Serial does the best it can to give the facts and we did our best to lay them out in a way that's a little easier to visually comprehend. The story is a complex one and our project just further proves that the Hae Min Lee murder is not an easy one to solve.